I stewed over what to make with my Briar Rose bundle from Quilt Market…and after 2 weeks of stewing I cut into it late one night without any plan. In the morning I realized that was a stupid thing to do. I should not make important quilting decisions late at night! These wild daisies are beautiful but smell like wet dog. I told Sophie to smell them and she agreed… they stink! Briar Rose by Heather Ross for Windham Fabrics is available next month…yay! Sophie is just gorgeous! Fabrics/flimsy – divine! Very, very feminine. Very beautiful quilting for a late night! That is one adorable photo of a true expression! I am chomping at the bit for Briar Rose to come out! I just love Heather Ross' prints, but, of course, I think everyone does. That baby is so adorable. I can't believe she's getting so big. I started following your blog when you were pregnant with her. Time really does fly, doesn't it! 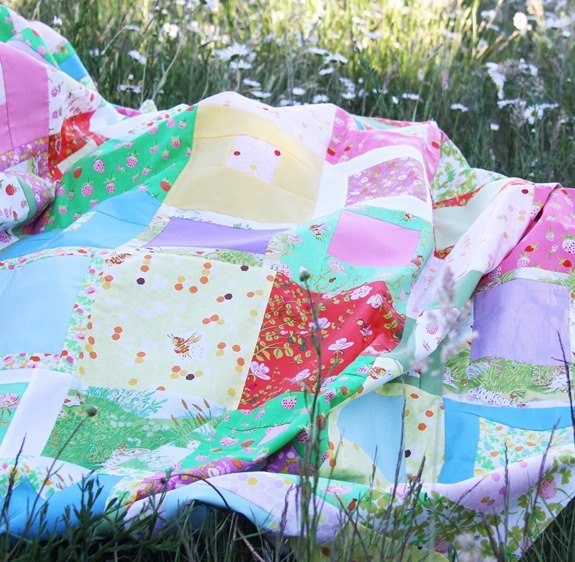 The quilt is really cute, but let's be honest…Sophie wins the 'cutest' title in these pics! She is adorable, love the face she is making. Now how to quilt this wonderful top??? Oh, this is so beautiful – full of summer! I love your photos! I absolutely love this quilt. It is simple, feminine and oh so sweet! 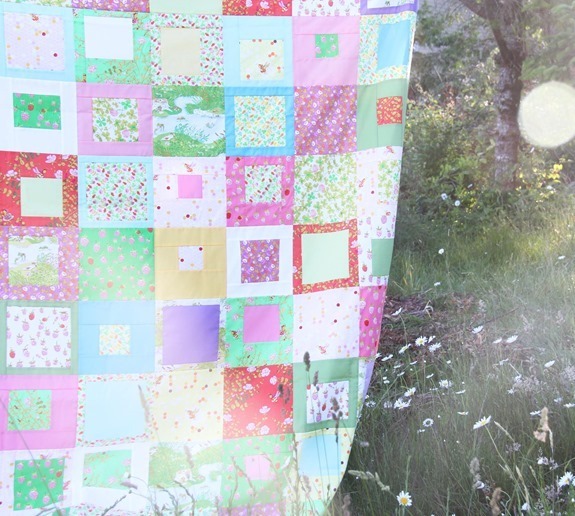 The quilt and the photo session and the photo session venue is perfect! I love it! Love the quilt and Sophie is too cute ~ love her little wrinkled up nose! Me with a pair of scissors and no plan = disaster ! You without a plan and great fabric = creative wonderfulness ! Children do grow so fast.. your talent of capturing moments like these with your kiddos are priceless ! So adorable and the quilt is cute too! Just look at that cute little crinkled nose!! :o) Adorable! I think your quilt is lovely and your daughter a true sweetie. I know what you mean though about making decisions late at night that aren't quite as well conceived as they could be. I make more mistakes late in the day. Better for me to think things through and generate ideas, then tackle them fresh the next day. 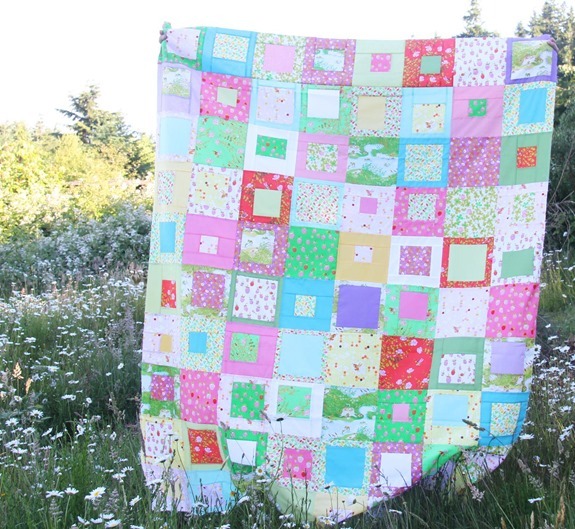 This quilt looks great! Love all the colors. The frog print is super cute! Your daughter is so adorable. 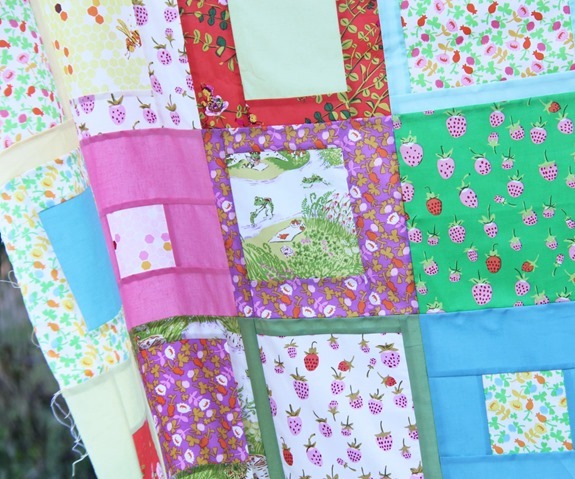 A gorgeous quilt and great pictures! 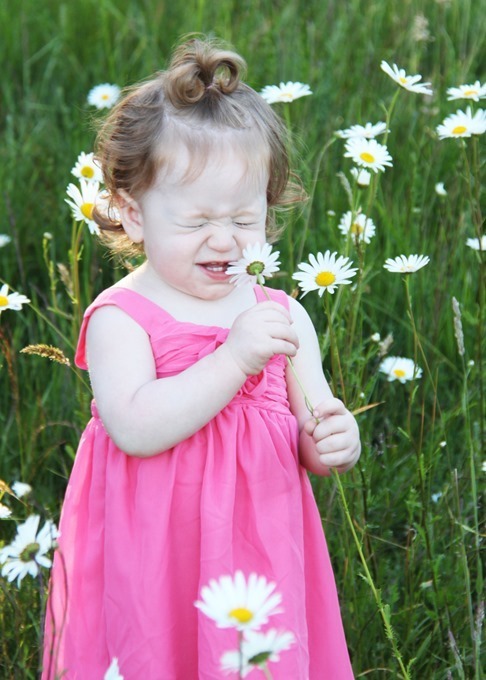 Shame those pretty daisies smelt so bad! Love the fun fabrics in the quilt. I love daisies. Sophie's expression is priceless and so honest. What a cute little face that Sophie made! Makes me smile. I love that quilt! It turned out great!!! Haha! I can relate to that! I never wield a rotary cutter after 9 pm or after one glass of wine. Sewing is OK. I can unpick that. I just cannot uncut the tired oopsies. Of course, your late-night adventure ended beautifully. That last one is a classic photo and definitely a keeper! That picture is hysterical! I have a rule in my house, no cutting anything after 10 PM. This is because, when we were first married and remodeling a kitchen late at night after we both got home from work, my DH was having trouble with a cabinet not fitting. Around 11 PM I was in tears as my husband was cutting part of the cabinet off with a hack saw — and in the morning, he realized that there was a simple solution that did NOT require Frankensteining the cabinetry, but he was just too tired the night before to think of it! But your fabrics are so lovely, the improvised quilt shows them off perfectly. You got lucky this time!